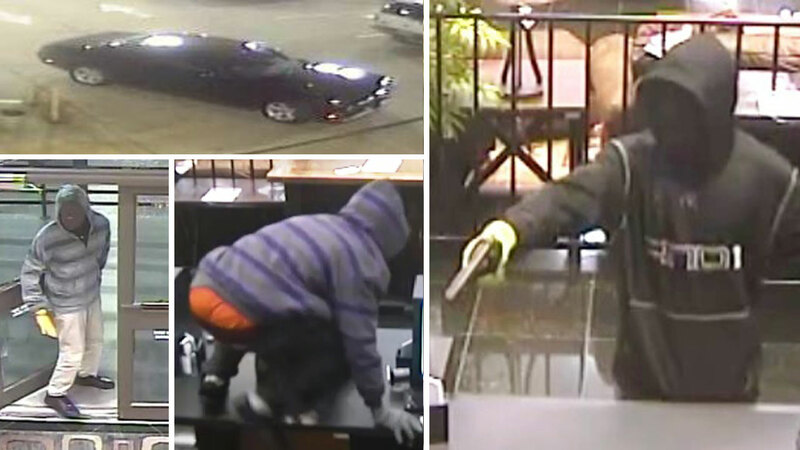 HOUSTON (KTRK) -- The FBI needs help identifying four suspects who pulled off an armed robbery at a bank inside the Gallery Furniture in north Houston. No one was injured during the Thursday night heist at the store, located off the North Freeway near Tidwell. According to the FBI, one suspect held the door, another demanded money from tellers while the third grabbed an undisclosed amount of cash from the drawers. The fourth acted as the getaway driver. The quartet drove off in a white Ford F-250, which they later abandoned. Now authorities are actively searching for the suspects. The driver was described as a short, Hispanic male with curly hair. The suspect who held the door open wore a gray hooded shirt with black horizontal stripes, khaki pants and gloves. The one who made the verbal demands was described as small to medium build, about 5'8" and 185 pounds. Witnesses say he sounded young. He wore a dark beanie hat, gloves and a black hooded sweatshirt with "And1" written in gray or silver on the front. The suspect who grabbed the money wore a gray hooded sweatshirt with purple horizontal stripes, black pants, black and white sneakers, gray gloves and orange boxers. Witnesses described him as quiet and respectful. They say at one point, the teller couldn't open the drawer and he said, "It's OK, ma'am." Investigators are also looking for the driver of a black Dodge Challenger that pulled up behind the suspect's truck. That driver is considered a witness in the case. Crime Stoppers of Houston is offering up to $5,000 for information leading to the charging and arrest of the bank robbers. If you have information about this case, please call the Crime Stoppers tip line at 713-222-TIPS (8477), or the FBI Houston Field Office at (713) 693-5000. Text TIP610 plus your tip to CRIMES (274637), or visit www.crime-stoppers.org. All tipsters remain anonymous.